The African Union Commission (AUC) has turned the spotlight back on Africa’s responsibility for its own development and efforts to curb illicit financial flows (IFFs) are firmly on the map. Illicit financial flows are part of Africa’s significant untapped resource potential. If efforts to tap into these resources are to gain real traction, the relevant continental and international partners need to be engaged in the process, with real incentives to tackle this challenge. US $ 1.8 trillion. This is the staggering amount of total illicit outflows from Africa between 1970 and 2008 estimated by Global Financial Integrity in its 2010 report ‘Illicit Financial Flows from Africa: Hidden Resource for Development’. These funds are key to Africa’s progress and development and the report unveils the disturbing fact that illicit financial flows (IFFs) from Africa grew at an average rate of 12.1% per annum in this period, depriving the continent of between US$50 and US$60 bn every year. The impact of IFFs on African capital and their loss for the development of the continent are now in the limelight of international attention. High-Level Forums capture the renewed drive to curb IFFs, be it at the UN Headquarters in New York or on African soil such as the 3rd Tana Forum, roundtable discussions or campaigns with catchy slogans like Stop it, Track it and Get it by the United Nations Economic Commission for Africa (UNECA). Strengthened by the launch of Agenda 2063, leveraging alternative and untapped resources for the continent’s development has caught the public attention. A number of initiatives have been launched to promote reflections on how Africa can finance its own development. Under the leadership of Madame Dlamini-Zuma, the African Union Commission (AUC) has turned the spotlight back on Africa’s responsibility for its own development. Agenda 2063 is an overarching strategic framework for the next 50 years and aims to encourage African countries to strategically exploit all possible opportunities available to them, ensuring positive socioeconomic transformation in the immediate, medium and long term. The Agenda 2063 draft document explicitly asks what strategies Africa should pursue to encourage domestic resource mobilisation (DRM). Such questions have unleashed research and discussions and provoked proposals aimed at bringing about an efficient use of Africa’s resources that include curtailing IFFs. The AU’s NEPAD Planning and Implementation Agency (NPCA), UNECA and the African Development Bank (AfDB) all highlight the continent’s “significant untapped domestic resource mobilization potential” while proposing instruments that could, or already, be in place to attain Africa’s development aspirations and effectively fund national and regional programmes. Stock Market capitalization rose from US$ 300 bn in 1996 to US$ 1.2 tn in 2007 and some fifteen African countries have established Sovereign Wealth Funds with a value of at least US$ 157 bn. Another important resource is the continent’s diaspora remittances, which reached US$ 64 bn in 2013 and the securitisation of future receivables and diaspora bonds that hold the potential to generate some further US$ 20 bn every year. In the light of this, Africa’s capacity to finance its own development seems no longer questionable. This capacity is underpinned by research that is putting foreign aid money into perspective by demonstrating that IFFs currently outweigh ODA. Now the question is how to access such funds? Accessing funds for development is also about creating incentives, reliable mechanisms and instruments. In this context, the AU seems to have elevated the curtailing of illegal transfers of capital as a potential source to one of its highest priorities. Together with UNECA, the AU has established a high-level panel on Illicit Financial Flows, chaired by former South African President Thabo Mbeki. High-level panels might be able to get the thinking going and propose measures but the implementation capacity lies elsewhere. The High-Level Panel on Alternative Sources of Funding the African Union chaired by H.E. Olusegun Obasanjo has proposed several DRM instruments. 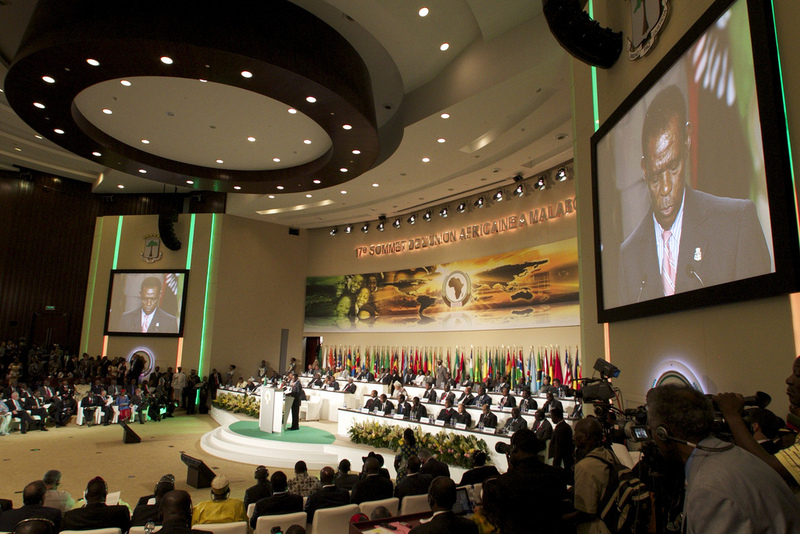 Out of this came of two options for financing the AU, retained by the AU Assembly of Heads of State and Government in 2013, only to be rejected by African finance ministers during the Seventh AU-ECA Joint Annual Meetings in Abuja in March 2014. This toing and froing demonstrates the vital need for clear incentives that build upon proposals for financing Africa’s development that would actually convince stakeholders involved to implement and follow through on commitments. Besides commitment and leadership of African governments, institutions and the private sector, the challenge will be to effectively engage the pertinent stakeholder in the consulting and drafting process of continental implementation strategies. Agenda 2063 and its short-term action plans need to be linked to already existing national development plans if they are to gain the backing and impact required for their successful implementation. To convince stakeholders of the validity of their approach, the AU and UNECA are making considerable efforts to communicate the ideas and findings of the 2012 established high-level panel on IFFs at various forums and summits. UNECA’s Executive Secretary Dr Carlos Lopes recently stressed the far-reaching implications of IFFs and touched upon incentives for African states. Arguing that Africa’s fragile or failed states are the main sources of illegal outflows that “threaten governance by undermining institutional resilience and weakening confidence, brewing cynicism in government” and he emphasised the need for action. Nigeria, among others, has been able to repatriate some of its stolen funds, yet, it is also leading the list of accelerated IFFs between 2000 and 2009 with at least US$ 250 bn missing. The most common channel for IFFs to leave Africa is through international trade, so effective policy measures must be taken at the international level to effectively address them. This is also why Thabo Mbeki relentlessly emphasises that continuity and collaboration with the international community is crucial to ensure better transparency, concrete policies and better oversight of banks and offshore financial centers that absorb illicit flows. The need for cooperation and coordination is also vital when it comes to implementing regional and continental visions that can only be successful taking national development plans into account. Posted on 19th May 2014 by newsafrica. This entry was posted in AfDB, Africa, African Union, Business, Democracy, Economy, European Union, Human Equality, World Bank and tagged Africa, African Development Bank, African Union, African Union Commission, Global Financial Integrity, List of sovereign states and dependent territories in Africa, UNECA, United Nations Economic Commission for Africa. Bookmark the permalink.